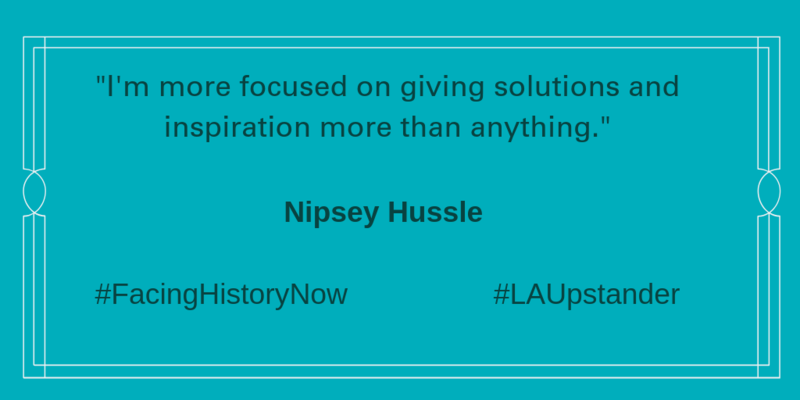 As part of our Upstander series, I want to acknowledge Nipsey Hussle, the hip-hop artist, entrepreneur and community activist, born Ermias Asghedom, who was killed in an act of gun violence in South LA on March 31, 2019. His death has shaken the Los Angeles community and beyond, especially among young generations who were inspired by his messages of positivity and possibility. He was deeply rooted and invested in his community and spoke openly about his past gang affiliation, using his personal experience to carve out a different path and bring others along with him. What are the lessons we can take from his music, his activism, and his life? How can we support the efforts of those inspired by Nipsey to be changemakers and to build on his legacy? How can we keep them safe? If you are a teacher, please share how you are thinking about these questions in the comments below. What questions are you grappling with after Nipsey Hussle's death? Share your thoughts below.